Polydamas Swallowtail - The Polydamus Swallowtail lacks the characteristic hindwings tails common to most other North American members of the swallowtail family. 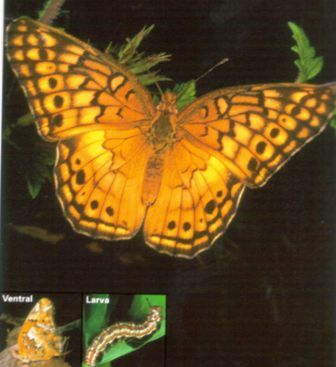 This trait combined with it's broad, yellow wing span of 4.0- 5.0 inches, makes this butterfly easy to identify. 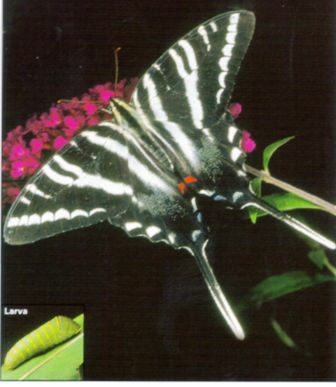 The Polydamus Swallowtail is a fast and powerful flier with a preference to open areas. 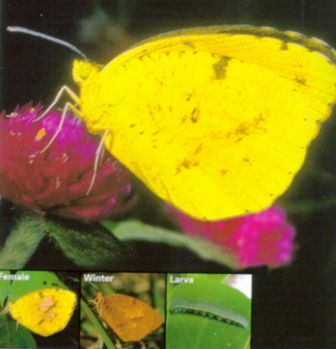 Primarily a tropical butterfly, it is rarely found north of the Florida border. This is a common butterfly of suburban and urban gardens. Adult polydamus are good colonizers and readily disperse long distances in search of suitable hosts. 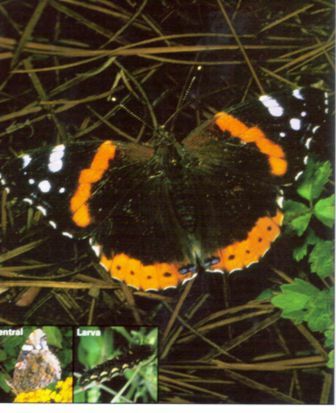 Red Admiral -The Red Admiral is a medium- sized dark butterfly with a wing span of 1.75 - 2.50 inches. This butterfly is quickly distinguished from any other species by its distinctive red forewing band. Particularly common in spring, the Red Admiral will readily explore neighborhood gardens. 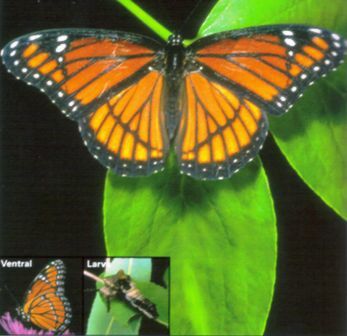 Adult butterflies have a quick, erratic flight. Male Admirals frequently perch on low vegetation or on the ground in sunlit locations. The larvae construct individual shelters by folding together one or more leaves with silk. Red-Spotted Purple - The Red-Spotted Purple, although lacking a hindwing tail, mimics the toxic Pipevine Swallowtail to gain protection from would be predators. Red-Spotted Purples, with a wingspan of 3.0 - 3.5 inches, are common butterflies of immature woodlands but are rarely encountered in large numbers. Adult butterflies have a strong gliding flight and are often quite wary. Males perch on sunlit branches along trails or forests borders and make periodic exploratory flights. Adults occasion visit flowers but often prefer rotting fruit, dung, carrion, or tree sap. Sleepy Orange-There is great debate on how the Sleepy Orange Butterfly got its name. One interpretation is that the butterfly's narrow black forewing spots looks like a closed eye. Whatever the reason for its name the Sleepy orange is far from sleepy. With a wingspan of 1.3 - 2.0, adult Sleepy Orange are extremely active and have a quick nervous flight. Another of Florida's migratory butterflies, Sleepy Orange produced late in the season move south and overwinter in reproductive diapauses. Newly emerged male Sleepy Orange often gather together in large numbers at mud puddles or damp ground. Zebra Swallowtail- The black and white Zebra Swallowtail can be confused with no other butterfly in Florida. Adults have a low rapid flight, and with their 2.5 - 4.0 inch wingspan, they adeptly maneuver among understory vegetation. Male Zebra Swallowtails regularly patrol their territory for females. This swallowtail has a shorter proboscis and is thus unable to nectar at many long, tubular flowers. Zebra Swallowtails instead prefer composites and are strongly attracted to white flowers. Summer-form individuals are larger, darker, and have longer hindwing tails. 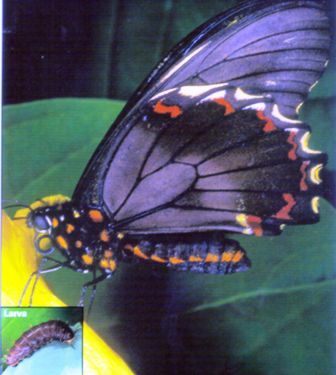 Spicebush Swallowtail -The Spicebush Swallowtail is one of four Florida butterflies that mimic the toxic Pipevine Swallowtail to gain protection for predators. Adult Spicebush are strong agile fliers with a wingspan of 3.5 - 5.0 inches, but this butterfly rarely strays far from its preferred woodland habitat. A true lover of flowers, the Spicebush Swallowtail readily ventures out to nearby open areas in search of nectar. These butterflies continually flutter their wings while feeding. Larvae create shelters by curling up the edges of leaves with silk. They rest motionless inside when not actively feeding. At maturity the larvae turn yellow and search for a site to pupate. Tiger Swallowtail - Easily recognized by its bold black stripes and yellow wings, the Tiger Swallowtail is one of Florida's most familiar butterflies. With a wingspan of 3.5 - 5.5 inches, adults have a strong able flight and often soar high in the treetops. 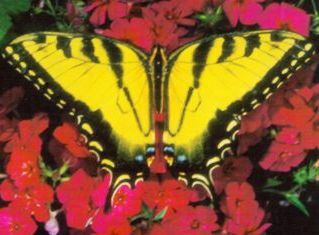 Commonly seen in Florida gardens, the Tiger Swallowtail are readily drawn to flowers. Male Tiger Swallowtails often congregate in large numbers at mud puddles or moist ground. 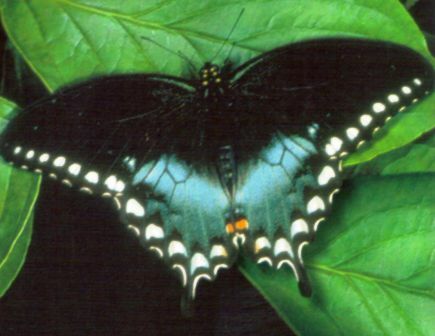 Dark form females mimic the toxic Pipevine Swallowtail to gain protection. Variegated Fritillary - The medium sized Variegated Fritillary shares its affinity for open, sunny habitats with the similar looking Gulf Fritillary, but is generally less common and highly localized in occurrence. With a wingspan of 1.75 - 2.25 inches, the Variegated Fritillary adult has a low erratic flight, but it regularly stops to nectar at available flowers. This butterfly is an occasional visitor to Florida gardens.